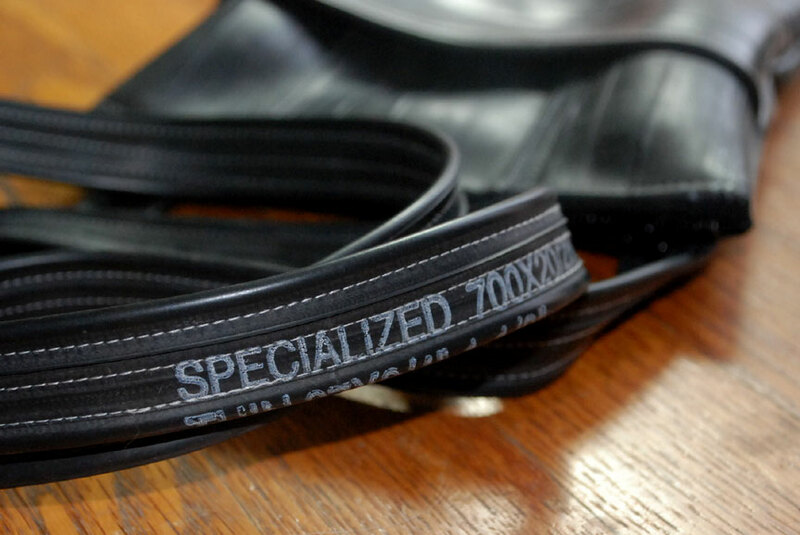 Cheng Shin and Specialized inner tubes bring you….my newest purse design. After riding my bike to a craft store yesterday and not finding any silver D-Rings, I made a purse I’ve been thinking about making for a long time. I’m really happy with it. It’s simple AND stylish. It’s a shoulder bag with a 51 inch strap, contrasting stitching, heavy-duty zipper and an outside pouch. It’s unlined. Instead of using hardware, I sewed the strap onto the bag on both ends. The finished size is 7 1/4 inches wide by 8 1/4 inches tall with a 5 1/2 inch pocket on the front. This purse has been sold! If you want me to email you when new purses are available, fill out the form below. I should have new ones up by Monday. She wins a fabulous Re-Velo coin purse. Congrats to Mary Ann and thanks for all your opinions! I’m working on the new purse with metal hardware so I should have them available online by Monday. 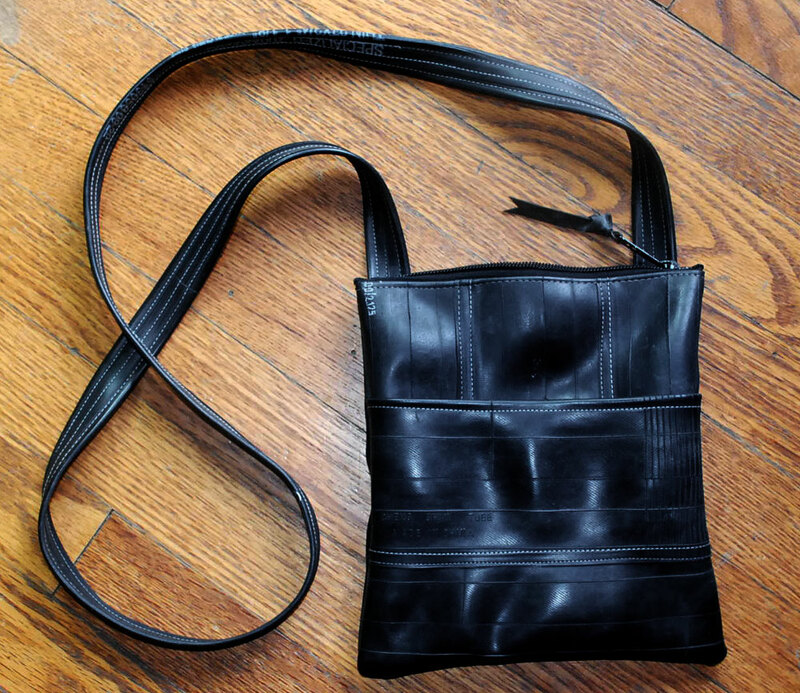 I made a new purse based on the Prototype A favorite. I decided to use plastic hardware so it’s less flashy but the consensus so far, is…BRING BACK THE SILVER METAL! Here are some pics…what do you think? And I haven’t forgotten all of you who voted on the prototypes…the drawing is coming…. Nice mention for Re-Velo in KC Star today. FYI section. They used a picture of my new tote bag. Now to make more…. …and if you’re in KC, I’ll be at Epic Bike and Sport for the Girly Ride tonite and then I’ll show Re-Velo stuff to all the gals. I made a tote bag on Saturday! I had been wanting to make some larger items for a long time but it seemed kind of daunting…so, I kept it simple. I used 5 tubes (I think). I sliced the tubes lengthwise once, then again so the pieces would stay flat. Then I measured a musette bag and cut the pieces 3 or so inches longer than that. Then I sewed all the pieces together till the piece was the correct height. It measures 13 inches wide by 15 inches tall with a 40 inch strap. I used a tube for the strap which makes the bag fun and bouncy, if not quite as sturdy. I’ll probably make the next one with a piece of twill tape inside it so it won’t stretch and it will be stronger, but I really like this strap though. Once I had 2 big pieces for the sides, I cut the edges straight and sewed them, right sides together. Then I cut up a cycling jersey(! ), using the pocket for inner pockets in the tote. I sewed the jersey on my home machine since I don’t have my serger set up yet. Then I popped the jersey inside and sewed it into the bag. I LOVE the jersey lining. Now to collect old jerseys…..one more project. So, DON’T THROW THOSE OLD JERSEYS OUT! GIVE ‘EM TO ME! You will be rewarded! I left the strap long on both ends and added a swivel clip on one for my keys and just a twill tab for the other end. Next one I’ll probably use contrasting thread. I took it to the Boulevard Cup cross races on Sunday and it worked great and I got some good feedback from a lot of people. You never know when you are hunched over a sewing machine wrestling with all this rubber whether you’ll end up with something useable and nice looking so all the input from bicycle riders is invaluable. I’m really happy with it. It came out great and I will definitely make more. I think it turned out swell! What do you think? Please comment and let me know your thoughts. 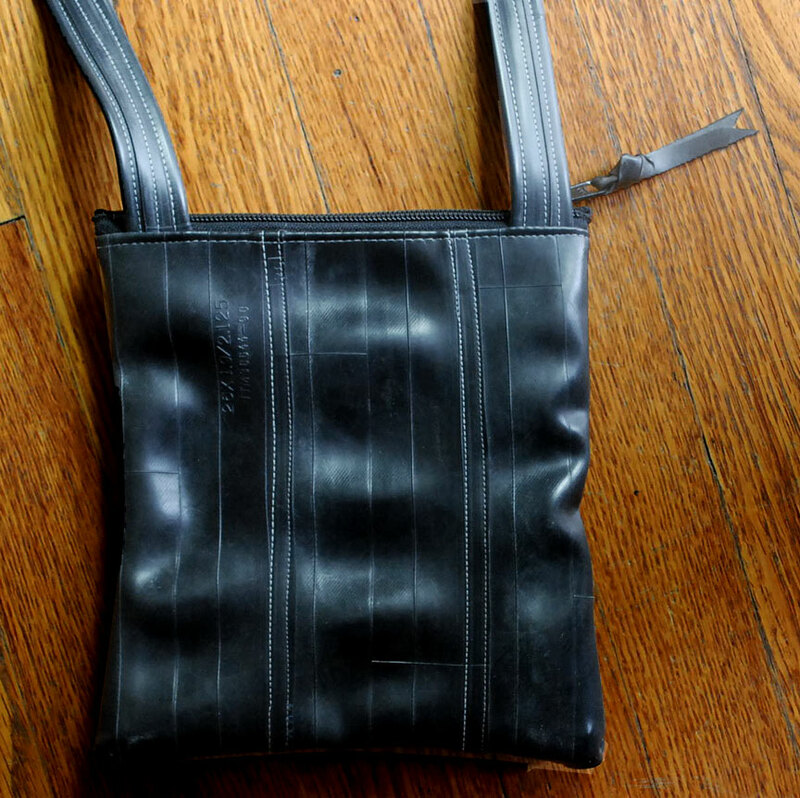 Top 3 Rubber Purse Prototypes / Let Me Know What You Think! OK, here’s what I’ve been working on. Click on the pics and they’ll get bigger! Made 3 tubes wide, contrast stitching, an outside pocket on one side – needs to be deeper and my pal Holly wants a snap on it. Plus it has a detachable strap. 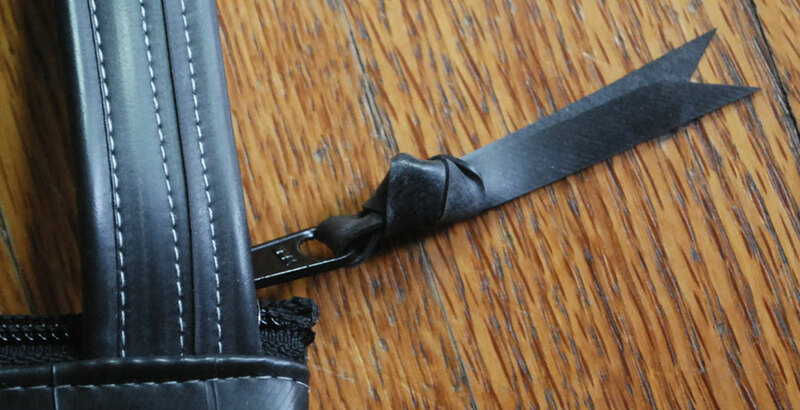 Strap is not adjustable now, I want to change that part. 2 tubes wide, contrast stitching, plastic triangle rings. 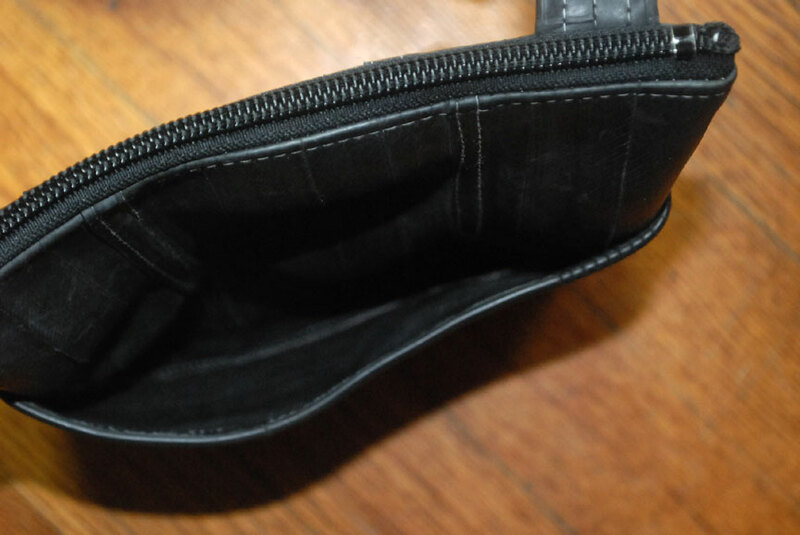 Started out as a fanny pack purse…still could be. Not sure about type of strap yet. I think the bag should be slightly wider. I added a grommet to the accessory bag and a hook I had lying around. I think it’s nice to be able to hook it to something. What do you think? Email me and let me know what you think of these! I’ll put all of your comments in a hat (or maybe a bag), pull one out, and they’ll win a free bag! Sorry about the lateness of this post…but here it is in all its glory, nontheless. Labor Day brought a productive trip to Maj-R Thrift at 47th and Mission Road. We rode our bicycles from the house. It’s less than 3 miles so no big deal. I had both panniers on my Specialized and used ’em both. I spent under $50 and got 25 belts, 10 purses and a pair of Polo Ralph Lauren wool pants. I’ll make those into riding pants for Mark for winter. I stopped in front of the store and whipped out my handy pocket knife and starting cutting all the belts off the buckles and D-rings since all I wanted was the hardware, and being on a bike with limited storage space, I wanted to lighten the load. A nice couple stopped to look at our bicycles and we started talking. They make corsets and things for the Renaissance Fair so they took a lot of the belt material for their projects! It was serendipity. Later in the day I drove (I know, I should have ridden my bike but it was late) to Hancock’s Fabrics on Metcalf and 93rd. All their notions were 50% off. I bought some twill tape and seam binding to experiment with, along with some rivets to make belts with. The seam binding is very tough to use but if I can get it to work, it will be perfect to finish some seams with on a new pouch I’m working on. I also got some very cool reflective tape in 3 sizes. I want to use it on handlebar bags. i may try a seat bag but I’m not sure yet. I’ll post info and photos soon about my purse prototypes. I’ve been remiss in posting all summer. Lots going on and I’ve been lazy for sure. But, I made a lot of bags and grew lots of tomatoes, peppers, melons, cukes and herbs so all was not sloth! The New Sewing Machine Is Here! The New Sewing Machine Is Here! My new/old Pfaff 561 sewing machine is home! My Pfaff sewing machine pre-motor transplant. Along with it’s brand spankin’ new motor that I need to install. The motor is HEAVY. Stay tuned for the harrowing updates of my transforming a 220V factory set-up to a 110V home operation. I also need to create a knee-lift for the presser foot. I started a trend. My brother and sister are both getting machines too. I bought them cheap from my old employer, a jeanswear maker. 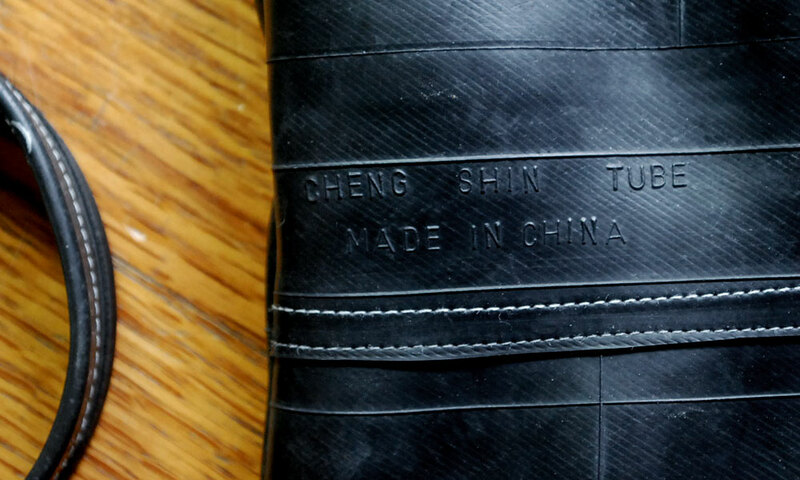 They used to sew prototypes…not anymore…it’s all done in Hong Kong and Mexico now. Sad. BUT, nobody in America wanted to pay more than $30 for a pair of jeans. So, they sold all their machines. It will be great to sew at home now! Although my day job employer’s machines are there for a back-up. My boss lets me use the company machines. He rocks. So, my baby is home and in a few days I’ll be ready to sew at bunch of new Re-Velo bags. I have LOTS of ideas for new stuff. Subscribe to my RSS feed and you’ll be the first to see what I’m up to. Bags on the run in Colorado. Re-Velo coin purse chillin’ with Frosty. Beer-thirty in Colorado. 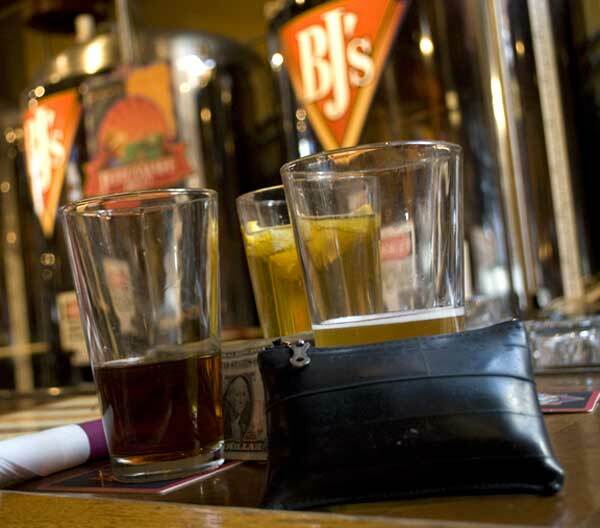 Thankfully, the coin purse is beerproof. 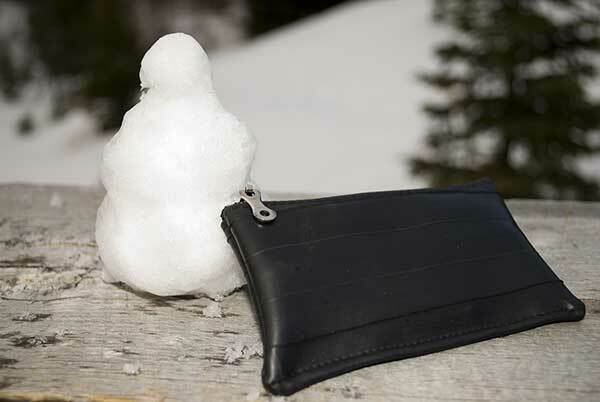 My pals headed out to the mountains last week and took their Re:Velo bags with them to hold iPods, cash, and coin whilst enjoying the slopes. Thanks to Bike Source KC. They really helped me out last week cuz I needed lots of tubes fast to fill a bag order.